The Ruijanpolku Trail is part of an ancient route named Ruijanreitti, which formerly ran from the Bothnian Bay, across the Saariselkä fell area and all the way to Finnmark (Ruija) by the Arctic Ocean. As far as we know, Ruijanreitti is the oldest route in Lapland; it was mentioned in some documents as early as the 16th century. The use of the route ceased at the beginning of the 20th century. During the opening years of this millennium, part of Ruijanreitti was restored to become a hiking trail and marked again in the terrain between Lake Sompiojärvi and Laanila. The Ruijanpolku Trail runs in between the rugged Nattastunturit Fells across the Sompio Strict Nature Reserve. You are only allowed to move along the marked trails in the Sompio Strict Nature Reserve, i.e., you are not allowed to turn off of the Ruijanpolku Trail. 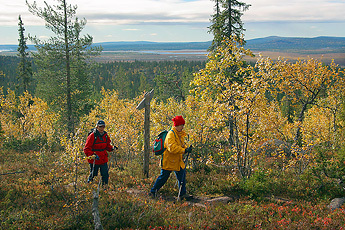 The trail continues through the forest landscape in the Urho Kekkonen National Park. The remaining 7 km run outside the national park taking you to Laanila. The total length of the marked Ruijanpolku Trail is 35 km. It is a summer trail that has been marked in the terrain. There are campfire sites, a lean-to shelter, duckboards in wetland sections and bridges for river crossing along the trail.